Mid 80's?!... in January?!... and a High Surf Alert?!... No, you are NOT dreaming! It will be here..., Thursday, Jan. 26th and El Porto and other west and northwest facing beaches are going to get SLAMMED! HIGH SURF WILL IMPACT THE COAST LATE THURSDAY AFTERNOON THROUGH FRIDAY MORNING. * SURF...BREAKERS WILL BUILD TO 6 TO 8 FEET BY LATE THURSDAY AFTERNOON AND THURSDAY NIGHT. THE SURF IS EXPECTED TO SUBSIDE TO 4 TO 6 FEET BY LATE MORNING FRIDAY. THE LARGEST SURF WILL BE ON WEST TO NORTHWEST FACING BEACHES. * IMPACTS...LARGE BREAKERS IMPACTING THE COAST WILL CREATE AN INCREASED RISK OF DANGEROUS RIP CURRENTS AND SNEAKER WAVES. ..."
Just in from LACo Recurrent (Ret. 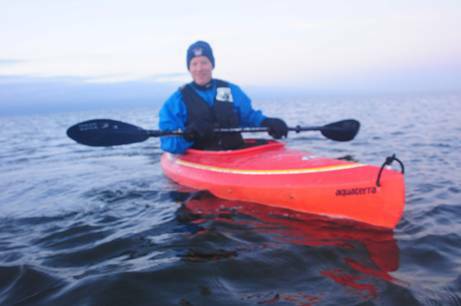 ), Tom Thorson, from the East Coast who through the winter continues to kayak in the early morning despite cold temps. 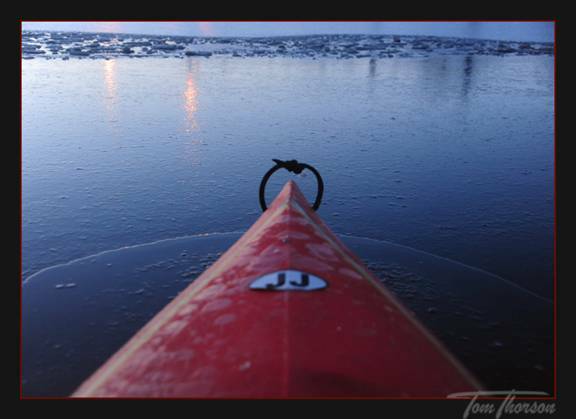 "It was around 18 degrees... perfect kayaking weather... 6 to 8 inches of snow on the ground... but the JJ kayak was ready." *** All Photos by & Copyright Tom Thorson 2012. Used here with permission. snowbird recurrents charging in the powder this winter... no excuses! 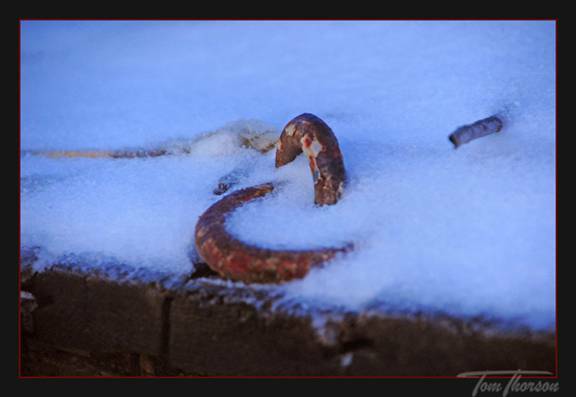 Dateline: Saturday, January 21, 2012. 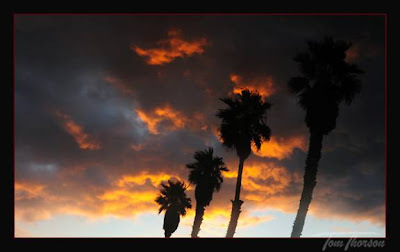 As the rain storm continued to pelt Los Angeles, the on shore wind and salt spray was heavy at the beach until past noon. It cleared up thereafter but stayed windy on shore thru till sunset. 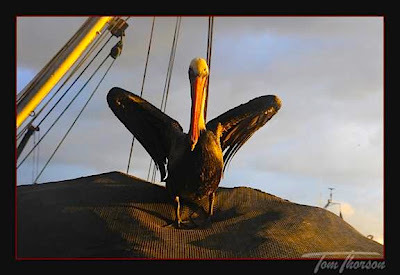 In an exclusive interview with "County Recurrent" News, Veteran LACo Recurrent Lifeguard/Photographer/Father/Grandfather, Tom Thorson, captured this amazing photo above of an absolutely Ginormous California Pelican early this morning on a set of nets down by the waterfront in San Pedro. This Pelican is clearly not missing any meals. These nets are not getting stolen, that's for sure! Clearly, Top Dog, er, Pelican, this Monstrous Pelican laid claim to this bundle of nets and as Tom approached to get a closer look at it, the Pelican raised its wings and actually advanced on Tom ! Whereupon having gotten this shot, Tom retreated to a safer distance. After all, he is back on the west coast visiting one of his daughter's who just gave birth to his fourth grandchild, and in this case a grandson, namely, Nicholas Robert Kruse, born Jan. 13, 2012. Apparently, there are two more grand kids in the oven, er, on the way too. Enough Thorson's to make the Norwegian Gods shed tears of joy. Congratulations, Gramps! And Thanks for letting us share your great photo of the King of Pedro Pelicans with all of us. Just in from LACo Lifeguard Captain Tom Seth! "I am writing to let you know of an extreme rescue that occurred in October 2009. At about 7:30 am, on Saturday October 31st, off-duty LACo Ocean Lifeguard Joshua Williams paddled out for a surf at the south end of Ocean Beach in San Francisco. The surf was 12 feet and the wind was blowing off shore by 10 mph creating perfect but dangerous conditions. The only problem was the dense fog allowed only 50 yards of visibility. Joshua entered the water, battled the relentless over-head shore break, and paddled through the deep water rip current area to the barreling peaks on the outside. He caught a couple waves and had not seen another surfer but as he sat on his board waiting for another wave he thought he heard a distressed voice coming from much further outside. Joshua paddled toward the voice and soon realized that it was a desperate cry for help. As it happened, another surfer had paddled out and as soon as he got to the outside break he was caught by a set. A number of waves broke on his head with one of them snapping his leash and sending his surfboard to the beach. 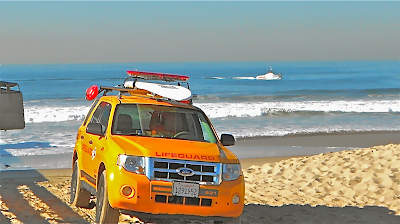 The surfer was then pulled further off shore by a rip current and the hard offshore wind. 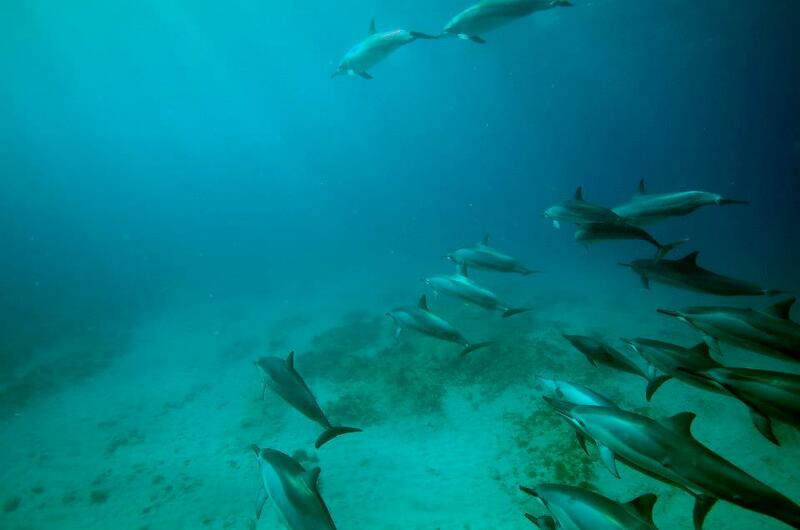 When Joshua reached the victim he was a quarter mile off shore in a state of panic, he had swallowed some water and was having trouble keeping himself above water. Joshua pulled the man up onto his surfboard to rest and calmed him down for about 10 minutes. Luckily by this time the fog had started to lift and they had close to a quarter mile visibility. Joshua pulled the victim in to just outside the surfline and waited for a big set to pass. He timed it perfectly, paddling hard for shore with the victim holding on to his feet and made it through the break before the next set. He muscled through the rip current and again timed the shore break perfectly between sets. A couple of surfers realized what was happening and met Josh in waist deep water to help. On the beach Joshua received a hero’s welcome by a large group of beachgoers that had found the victims surfboard at the shore line and feared the worst. The following letter was sent to Surfline.com by the victim and published as the letter of the week. Many Thanks to LACo Lifeguard Capt. Tom Seth for sharing this story of Josh Williams extreme rescue in the waters off San Francisco. And a Huge Shout Out of Kudos, Props & Way to Kick A** off duty and save a life by LACo Recurrent Lifeguard-Paddler-Surfer, Joshua Williams. Winter Storm Warning: El Porto! Dateline: Saturday morning, January 7, 2012. "Winter Storm Warning"! You are now entering EL PORTO! Check out that Peak offshore! LACo Lifeguard Captain Greg Lee, in his wetsuit, ready for action. How stoked were we to see that this crew working El Porto and Manhattan Beach were being led by one of LACO's Finest! OLS Jamie Orr assisting OLS Cosmo Flynn (off camera) change out 02 bottles... these guys are really on it! This Seagull owes its life to a concerned beach patron AND most of all to the surgical skills of Cosmo Flynn and a pair on narrow nosed pliars that removed a tangle of nasty hooks from a fishing lure. Nothing like a "Breakfast Sandwich" at Wendy's Cafe in El Segundo afterwards along with the L.A. Times showing LACo Recurrent/Pro Surfer, Matt Mohagen, in triumph after charging a huge wave on Jan. 7th at the El Segungo Jetty (L.A. Times, Jan. 8, 2012, Section AA, LATEXTRA). caveat: we also note here, for the record, that we are informed, however, that LACo Recurrent, Arthur C. Verge, Phd, prefers the Blue Butterfly Cafe around the corner on Main St.
*** All photos by & Copyright Will Maguire 2012. All Rights Reserved. (Swell revealing itself on north side of Venice Pier, Friday morning, Jan. 6, 2012. 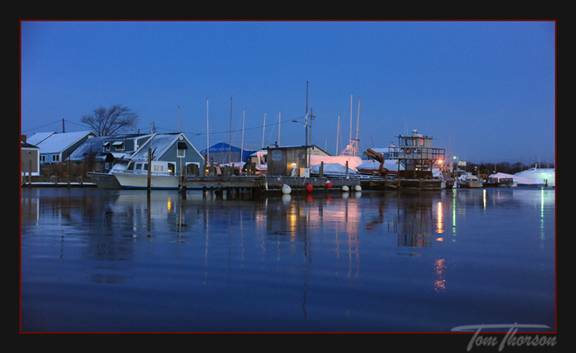 Gonna be another minus tide after 2 pm today. -0.5). note: no worries to the Central Section Competition crew as JVD will still be eligible to compete in Central Section. We begin this new year with a very special photo taken on New Years Day 2012 off Waikiki showing a pod of dolphins. Photo above courtesy of LACo Recurrent, Jeff McConnel. Photo by & Copyright Sebe Saenz de Santa Maria 2012. All Rights Reserved. Used here with permission. Thanks Jeff and Sebe! 10-4. "New Years Day 2012". Photo by & Copyright Kip Jerger 2012. Used here with permission. Per Kip: "The shot was taken January 1st. 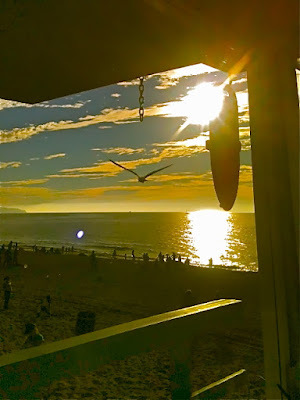 At Ainsworth Court in Redondo on the south side of Redondo pier." "This is probably the best I've ever heard life explained!"